Some genuinely wild women – and some more demure but no less lively types – take center stage in Paris Poirier’s vivacious documentary about the life and times of Maud’s, the longest running lesbian bar ever. This venerable San Francisco hangout opened in 1966, when homosexuality was still very much in the closet, and flourished through the 70s and 80s, only to shut down in 1989, a victim of the post-AIDS clean and sober ethic. In between, are many provocative personal stories of coming out, sexual politics and softball, along with flashbacks to the Hollywood gay bars of the 40s and the vice raids of the 50s. A witty and informative look at cultural evolution in the making. 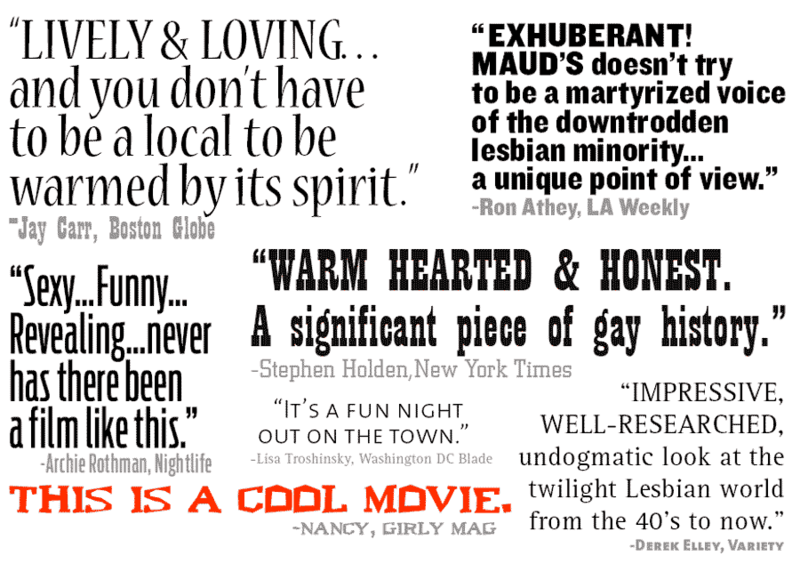 *Since its 1993 premiere, Last Call at Maud’s has played in over 200 theatres across the US and Canada. It has screened at film festivals from Halifax to Helsinki, including Berlin, Johannesburg, Madrid, London, Copenhagen, and Cork Ireland.